'Mortemar', the Richard Mortimer estate designed by Richard Howland Hunt of Hunt & Hunt and begun in the 1890s and enlarged over the following ten years in Tuxedo Park, New York. 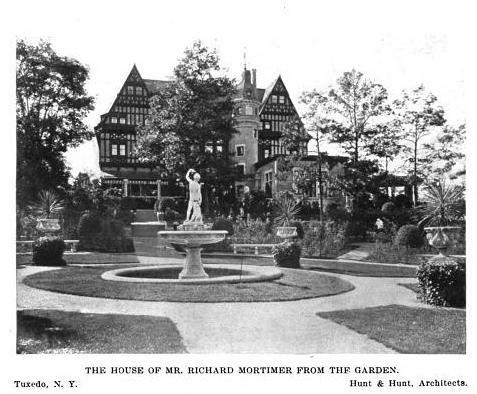 Mortimer was the brother of Stanley Mortimer of 'Roslyn House' in Old Westbury, New York. 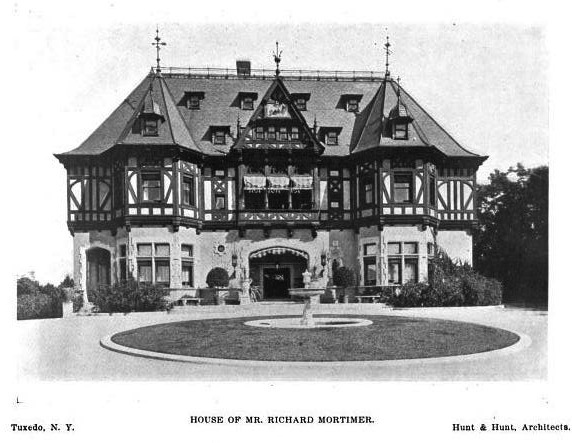 'Mortemar' has since been demolished but stood HERE, the driveway having been converted to Butternut Road. There appears to be some sort of garden ruin at the location but the view on bing is poor. Photos from Architecture, 1903 and Architectural Record, 1905. 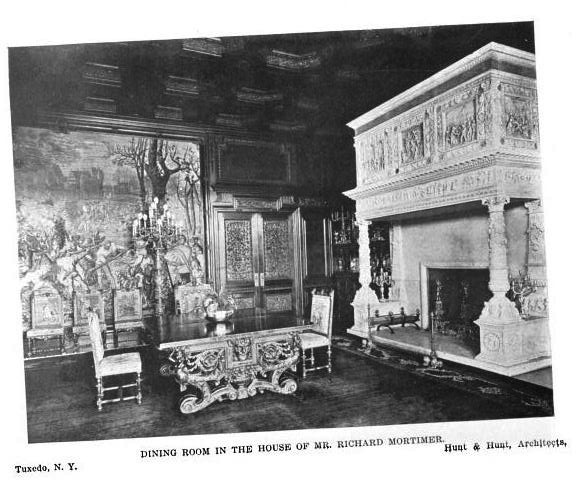 "The Chapel of the Holy Spirit was added to the undercroft in 1941,using pillars from the rose gardens of the former Mortimer estate, “Mortemar”, and an Italian marble hearthstone from the “Mortemar” dining room for the altar. 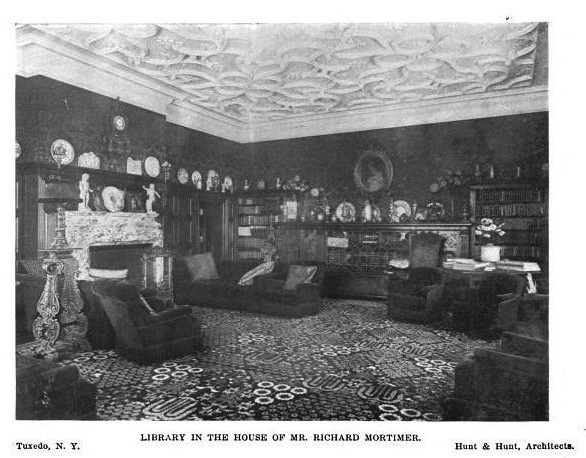 The iron-grilled doors also came from “Mortemar”." Wonderful Bavarian castle like exteriors. The dining room mantle is a work of art. All very magnificent, but the Brothers Hunt were rather grim. Definitely not their father. Grim or not, that front facade is fairytale perfect. Lots of half timbering and loads of detail. Can't complain either about all that fantastic wood paneling and ornate plasterwork inside. Seems that someone built a later ranch style home over part of the old foundations but left all the other remaining stone foundations intact as sculptural elements. To get a sense of the towering scale of this house, in the first photograph compare the height of the front doors with the floor to floor heights of the two primary floors. I am sure other houses of the era were similar, but this one seems disproportianately tall for some reason. The Mortemar site is on Ridge road. Butternut road leads to where the Keech estate was before it burned and a modern house is now sited on the ruins. 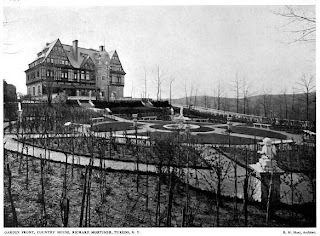 My grandfather was a butler in that home for many years. I recall visiting him at work as a child.